Who walks out with the title? 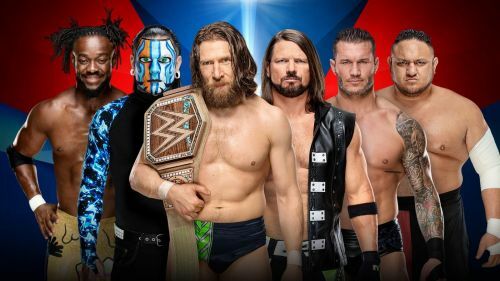 WWE Elimination Chamber pay-per-view is just two days away, and with the recent change in Wrestlemania plans it is a possibility that the match for the Raw Women's Championship will be the highlight of the show. With Toyota Center hosting the show for the first time, it is a moment that the sports arena wouldn't want to miss out on, and we may see some surprise entrances as well as some good performances by the performers inside the structure. The Fickle WWE Champion, Daniel Bryan, has been making waves within the company and the wrestling business in general. If he and his protege work together, we may see The Beard head into Fastlane and The Grandest Show of them all as the environment-friendly champion. His work has been top-notch, as has been The Usos, however, the latter is part of a controversy recently, and we may see some changes in this match, or there may be an unlikely alliance. Don't count the return of Bray Wyatt out because The Eater of Worlds knows a thing or two about making surprise entrances inside the structure. While some of us may be speculating that Akira Tozawa would win this match, the fact that he is still not over with the fans leaves us with an option and an outcome that may not be a fan favorite. We would see Buddy Murphy retain the Cruiserweight Championship against Akira Tozawa. This match would see the display of strength and high-flying moves, so expect some entertainment in the pre-show. Result: Buddy Murphy retains the title.